Starting to draft Beta RPG, the evolution of my homegrown roleplaying system, has thrown up a few headaches but none quite so acute as the question of how to model injury. You’d think that this matter would be easy to resolve. Given the multitude of solutions that have been proposed over many years, and through many RPG systems, I have to admit that I’ve yet to find one I really like. This post is my attempt to outline what I’m not looking for… and perhaps suggest some pointers towards what I do want. It all began with Hit Points. At least, it did for me. D&D gave each character a number of Hit Points at first level with a boost to that total every time you gained another level. When injured, the total points of damage were subtracted from the Hit Point total… and when you ran out of Hit Points then you also ran out of life. Simple. Too simple for me. I’ve always felt that, although this is an easy system (and probably the most popular), it’s a system that creates the kind of character who is seemingly unaffected by injury… until they fall over unconscious or dead. A bit too sudden for my taste. Traveller had the injury applied to the character’s physical stats. Given three core stats (Strength, Dexterity and Endurance), each point of damage was applied to each of the three in order – first Strength, then Dexterity, then Endurance… repeat. When one stat hit zero you would fall unconscious; when all three were zeroed you would be… er, dead. This was kind of a neat variation on Hit Points which delivered a part-way unconsciousness, forcing the player to think carefully about which stat to apply the wounds to. It was, however, fiddly and somewhat deadly. Another common solution was the series of damage tracks which, effectively, divide up the Hit Points into a series of chunks. As each track (chunk) is zeroed the hero would receive a negative penalty (such as -1 to all tests) which accumulated as more tracks were eroded. 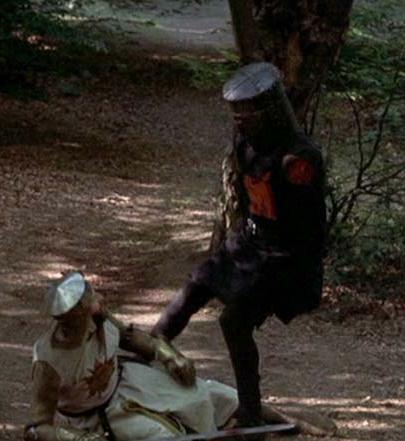 This solution corrects the Black Knight problem of basic Hit Points quite effectively. It does, however, require more management than simple maths… and you have to remember what your current penalty level is for each action you take. Some systems add in extra modifications to Hit Points, such as the accumulation of a turn-by-turn drain to your health to represent bleeding wounds and such. These just give me a headache because I have to remember to decrement the bleeding every turn. Ouch. Rolemaster and one or two other systems introduced a combination of Hit Points with extra physical trauma caused by “Critical” strikes. In these systems you might roll on a table to see what other effects you target gains on top of running out of Hit Points. While I love Rolemaster… well, this system of charts is something that puts a lot of people off. Rolling on damage tables is not everyone’s cup of tea. Remembering the additional effects can also get complicated. Is there no easy, simple answer to injury? Can my brain not come up with a more elegant way to model what I want? Any alternative systems that I’ve obviously forgotten about? Any suggestions of your own? I recommend looking at the damage system from Inquisitor, the narrative skirmish game from GW (you may recall that I wrote the Inquisitor campaign for the Dark Stars event that you ran, Che). Each character had a damage increment that had too be exceeded in order to increase the severity of the effect on each hit location. For a skirmish miniatures game, it was very complex, but ideal for an RPG. Thanks, I’ll go and refresh my memory… although I do remember it being complex. 😉 Mind you, I do remember that I enjoyed the game immensely.